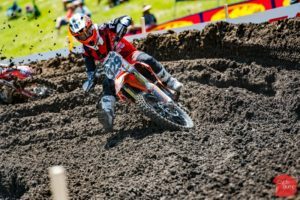 The TPJ Fly Racing team traveled to Lakewood, CO for the third round of the Lucas Oil Pro Motocross series at Thunder Valley Motocross Park. This week, we welcomed new team riders Mason Wharton (250 class) and Logan France (450 class). Both of these young riders are very talented and driven and are great additions to the TPJ Racing team. We also welcomed support team riders Austin Kouba and Ed Foedish. Kouba is a young rider out of Boise, ID. We welcomed him under the TPJ Fly Racing tent this weekend and helped him out as a fellow Carl’s Cycle Sales team member. TPJ Racing team owner, Ted Parks, found out about Foedish being one of the oldest riders on the field and welcomed him under the tent – Ted is always about supporting the underdogs. With two new team riders lining up this weekend, we were excited to test the waters and see their capabilities. In 250 qualifying, Mason Wharton narrowly missed a qualifying position by three spots. He went on to line up in the consolation race as a last chance to qualify. In the consolation race, Wharton started in fifth and worked his way up to third place out of four qualifying spots. He charged hard to earn his place and went on to the main event motos. He would battle through the lengthy 30 minute motos and go on to finish 33-31 for 33rd overall. Wharton now aims to focus on his qualifying times at the next round in order to qualify directly into the show and preserve his strength and energy for an improved finish. In the 450 group, Logan France was able to qualify directly out of timed practice in 31st position. 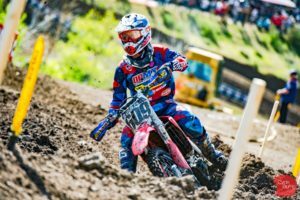 In the main event motos, France struggled with the chaotic starts that plagued the 450 class at Thunder Valley. A few bumps and tangle-ups left him clawing back ground. In both motos, France came back from last to secure a much better position. In moto one, he battled all the way to 31st, and in moto two he battled to 30th for 38th overall. We were very impressed with France’s performance this weekend as it was his very first Lucas Oil Pro Motocross event and he qualified directly from the timed practice and went on to race against the best riders in the world for the full 30 minutes. We are excited to see where his progress will put him in the upcoming weeks. After such an exciting weekend at Thunder Valley, we are looking forward to a week off to regroup and get our riders ready for the next event. We are excited to see what the future holds for our two new additions to the team, and want to thank our sponsors for supporting them in their chase toward their dreams. We are very grateful to the sponsors who have continued their support this season and go above and beyond to help us boost our athletes to the next level. Tokyomods rider Brad DePrenger just missed the motos qualifying as the first alternate.